Thread: Echoes of the East-African Slave Trade - Distant Diasporic Matches - IBS or IBD? You mentioned having Kenyan/Tanzanian (presumably Bantu-speaking?) relatives at 23andMe, did you check their matches as well? Some Bantu speakers have relatives from distant parts of Africa. In a way this is unsurprising, since Bantu speakers share recent common ancestry. What I'm thinking is perhaps your New World matches are indirectly traced to your Kenyan/Tanzanian relatives, who in turn may have had relatives who were taken across the Atlantic from ports in say Mozambique, Angola, and/or the Congo? It may seem far-fetched, but some of these 5 cM matches are older than from the past couple of hundred years, and some do not even trace unbroken segments of common ancestry (which is evident since some users do not share certain small "matches" with either of their parents). I'm thinking along the same lines. I found this useful article which discusses socalled "IBS by population": DNA segments which have been recycling, piling up and circulating within the genepools of not only neighbouring populations but also geographically separated ethnic groups which have a much more ancient connection by way of prehistorical migration, language replacement etc. I suspect this phenomenon might explain a majority or even almost all of these reported matches within the 5cM-7cM range between Eastern Africans (north from Mozambique) and Afro-descendants in the Americas. Although again i will also not rule out any genuine but still exceptional IBD matches (within a genealogical timeframe of ~500 years), especially when dealing with segments >7cM. The socalled Countries of Ancestry tool (CoA) has sadly been discontinued by 23andme, but i managed to make a few screenshots among my shared right before it got axed These CoA results can provide very useful information but they have also often been misinterpreted. It's good to be aware that they are based on the selfreported nationalities of the grandparents of your matches. And this might be misleading in some cases as it will not always directly relate to your own ancestral background. For example someone who is originally of Portuguese descent could have been born in colonial Angola and so too all 4 of his grandparents (Angola used to have a rather sizeable locally born white population in the early 1900's), this person might then show up as an "Angolan" match. Also CoA doesn't tell you which way the geneflow occurred. To continue the example, your mutual connection with this socalled Angolan match might imply that you yourself actually might have Portuguese blood rather than any Angolan lineage. But another possibility might be that somehow some of your ancestors married into a Portuguese family, distantly related to your socalled Angolan match. And a third option could be that someone of an unknown nationality X married into a Portuguese family several generations ago and a close relative of this person with the same background also married into your own family many generations ago (beyond recollection). Other confusing and unexpected scenarios might undoubtedly also be valid. Bottomline being that in the absence of any paper trail or confirmed genealogy the complexity of these matches and what they may imply should not be underestimated, even if they turn out to be genuine/IBD. Of course the chances of them being false positives/IBS should also always be kept in mind . Another limitation of the CoA results would be that they can only reflect matches found among a 23andme customer database which is naturally dominated by people located within the USA. So the actual proportions of country matches should not be taken too seriously or as being representative. 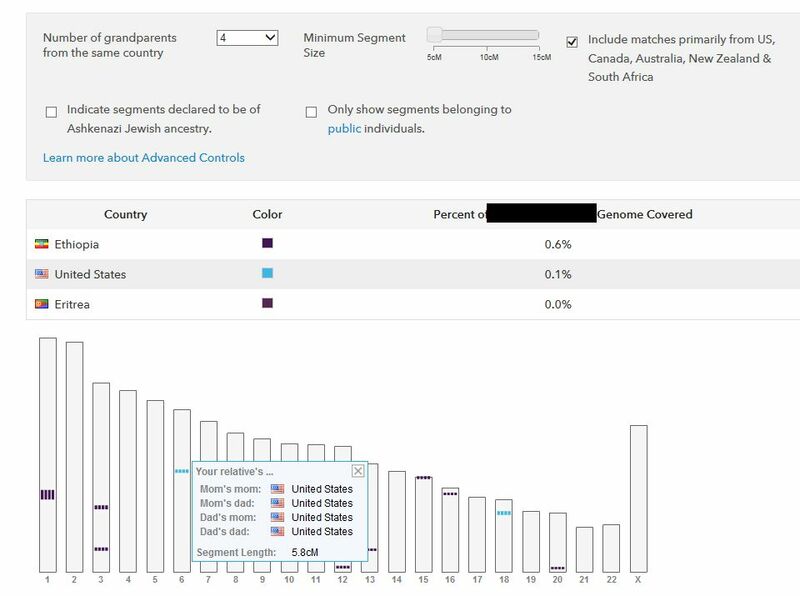 Even when actually a surprisingly high number of all sorts of nationalities is present among 23andme customers and especially when applying more conservative settings (such as 4 grandparents from same country + shared segments >7cM and even more so >10cM) you should get a pretty good indication of the countries of ancestry of your main matches. Last edited by Don Felipe; 03-13-2016 at 07:39 PM. I would bet that it really is a White American. For some reason, most Ethiopians/Eritreans I've seen have one or a couple of White American or European matches, almost always in the 5-6 cM range. I would bet that these are usually IBS, and the reason why they are more common than MENA matches is that Europeans and White Americans are much more numerous. In the rare cases when they might be IBD, they are probably older than what 23andMe suggests. I myself have at least a German-Romanian, and an Irish woman. I actually don't recall seeing any New World African descendants among Horner matches. I actually don't recall seeing any New World African descendants among Horner matches. Not exactly New World connections, but two Somali i'm sharing with showed South African and Madagascar matches, all<7cM though. I could see how Somali might have ancestral connections further south along the Swahili coastline, even when the actual genealogical relationships or direction of geneflow might be complex to disentangle and also involve a MRCA of a third nationality/ethnicity. A (northern) Sudanese i'm sharing with also has a small match from South Africa (most likely a Coloured person). Last edited by Don Felipe; 03-13-2016 at 07:58 PM. Several DNA vendors have set higher thresholds to offset the high percentage of IBS detections found among older colonial as well as Jewish/Hispanic customers due to Endogamy. DNA testing provides a unique avenue to unravel ancestral connections. Especially for the Afro-Diaspora finding African DNA matches can be a thrilling experience. Still personally i agree these thresholds should be set at higher cM levels even when it means that potential genuine matches will no longer be reported. I prefer estimates to be conservative and as robust as possible rather than include an unknown amount of false positives which could lead you astray from connecting with your real relatives and mislead you about your regional/ethnic origins within Africa. My frustration is with automatically dismissing the possibility of some of these exceptions being real IBDs; I'm convinced the denial is based on the lack of history taught regarding the hegemony of the Swahili in East-Africa. I understand this frustration given your own localized perspective. Thanks so much for sharing that piece of history about the regional role of the Swahili! i find it very fascinating especially the Uganda angle you provided. I will comment on it in more detail later on. I was wondering how you felt about these news articles which came out recently. "Another US president from Kenya? Ben Carson claims Kenyan roots"
" My ancestor was a Turkana, says US presidential candidate Ben Carson"
"Dr. BEN CARSON caught red-handed lying about his Kenyan roots"
“Go away, you are a political CONMAN” TURKANA elders disown Ben Carson"
Last edited by Don Felipe; 03-14-2016 at 12:19 AM. You also have to ask your relative to test the same segment. The result you get is for the segment on both chromosomes, but the match with your relative is only on one of these. So you need to test both to figure out the overlapping 50%. Alternatively you could see if your results on that segment are less NS than other parts of the genome or about the same (former would suggest the shared segment is from Bantu-related ancestry, latter would suggest NS ancestry for your relative). That wouldn't be necessary, all you need are both kit#s run in the Admixture tool. Use the one-to-one tool to note the overlapping segment and chromosome of your match (ex. 90095485 - 92698027 (5.134 cM) - chromosome 9). Enter the Admix tool, choose the admix calc' of your choice, select Paint differences between 2 kits, 1 chromosome and enter the chromosome along with both kit#s. You'll get a display for common ancestry along the chromosome; refer to the location of the overlapping shared segment. Last edited by NiloSaharan; 03-14-2016 at 12:54 AM. Very fascinating, i have actually noticed many Eastern Africans receiving matches with people from either Mauritius, Reunion, Seychelles or the Comores. All of these islands being located in the Indian Ocean and having been colonized by Europeans who brought over enslaved Africans from the mainland, in part also from Swahili ports. Especially the French seem to have been involved (also in Mauritius! ), if you check the previous chart i posted , almost half of the 6,324 people taken from Swahili ports to the Americas, were brought to either Haiti (Saint Domingue) or other parts of the French Caribbean. All of them arriving in the period 1777-1820. There were notable clusters of mtDNA between Ugandan and Dominican Republic samples; I wonder if any slaves from Saint Domingue trickled into DR. Here's a quote from a thesis paper done by a Ugandan biochemist -- the notion of slavery being a possible reason is deferred based on lack of substantial historical records. "The clustering of the Ganda and Acholi samples with African-American or Dominican-Republican samples was attributed to, albeit with difficulty, possible slave trade occurring between Uganda and America. The pedigree analysis performed on the individuals ruled out a possible clustering due to recent or near recent admixture of Ugandans with Americans brought about by increased mobility due to modern transport technology as the individuals included in the study came from pure lineages or at least three generations. Scanty historical records suggest that slave trade existed between East Africa and North and South America (Ssekamwa, 1994). It could be possible that Ugandans were shipped to other countries in Africa or Asia before their final destination to America but again no detailed historical records are available to support such a scenario (Ssekamwa, 1994). The lack of complete sequences in other African countries also hinders the proposal that a different African country was the source of the slaves but its gene pool was similar to that of the Ugandan individuals in this study." Last edited by NiloSaharan; 03-14-2016 at 12:36 AM. I still think customers should be given the option; I like that AncestryDNA users have visiblity of <7cM matches *with a blurb explaining detection in this range may or may not be IBD/within a genealogical time frame. Had GEDmatch not existed, I wouldn't have learned so much about IBS and IBD matches. Given most DNA users are from the western hemisphere with an overload of matches, I can see why companies would prefer to narrow the scope of detected relatives -- especially for customers that are only interested in genealogy on a very surface level (probably 80% of them - pure speculation on my part . Last edited by NiloSaharan; 03-14-2016 at 02:02 AM. I wonder if any slaves from Saint Domingue trickled into DR. It's interesting that two out of three Kenyans i posted above had a Haitian match and one of them also a DR one, even when below 7cM. 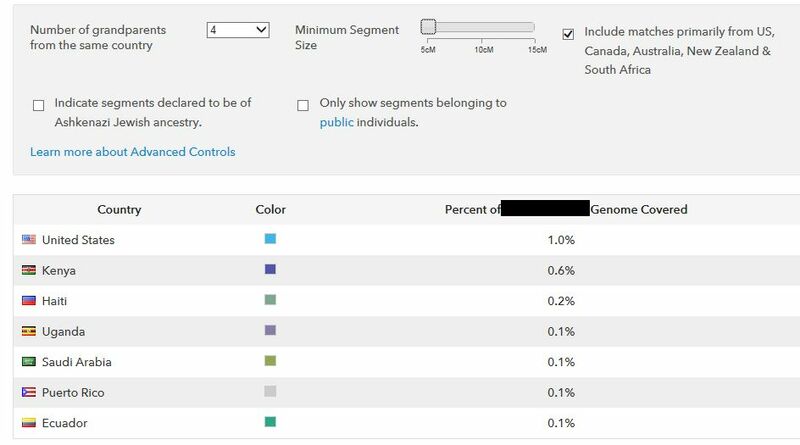 Also intriguing to me is the 0,9% East African being shown for this Dominican on 23andme. It's obviously a miniscule amount. 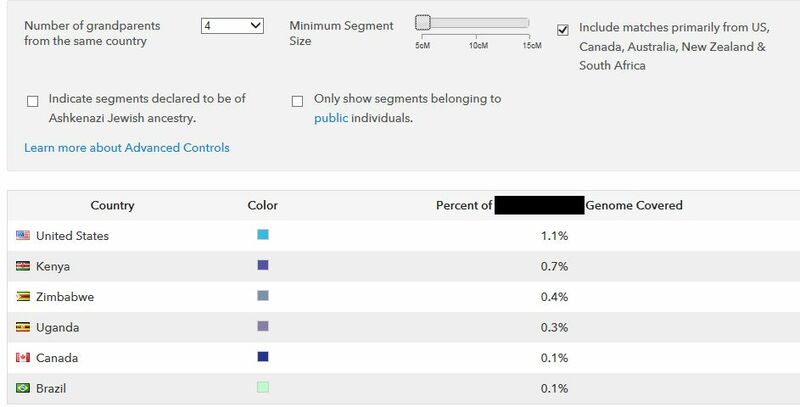 But i find this category to be quite reliably indicative of non-Bantu speaking East African ancestral connections, even when not to the full extent as you know Almost all the AC's of New Worlders i've seen on 23andme (literally hundreds) score zero% for it or just 0.1% or 0.2%. Which to me serves as a reminder that generally speaking their ancestral ties with regions to the north of Mozambique are very minimal or even absent. However this Dominican is actually showing the second highest East African score i've seen sofar in the Americas, even if it's still below 1% and obviously strongly diluted Again i think this category has more of a signaling function than being fully accurate or descriptive perse. But given that it's so rare to see even this kind of amount on New Worlders i think there's an increased chance he might have some Swahili mediated East African connection (originating from the north of Mozambique). ALthough actually this tiny portion of his DNA could also have been inherited from a West African Fula ancestor as they can also score considerable percentages for this socalled East African category (in their case obviously a misnomer but still suggestive of shared ancestral connections across the Sahel and possibly dating from thousands of years ago rather than some centuries). Last edited by Don Felipe; 03-14-2016 at 09:42 PM. ^I guess we can rule out having a second Kenyan-descended US president for the near future Much has been said about Obama's "blackness" and how much he really has in common with multigenerational African Americans. I found it fascinating to observe how this debate evolved the last 8 years. From a genetic perspective i suppose it should be clear by now that he's much more likely to have IBD matches among African Americans through his White American mother, sharing European DNA segments with them, rather than having Afram matches by way of his Kenyan father and on DNA segments labeled as "Nilo-Saharan", "East African" or whatnot. Last edited by Don Felipe; 03-14-2016 at 10:04 PM. True, i agree that slave voyages departing from Swahili ports might have been underreported and also some captives might have been transported first from the Swahili Coast to Mozambique ports and only then to the Americas. Or they might have been transported directly from the Swahili Coast to Portuguese settlements in Asia (Goa, Ceylon, Malakka etc.) and from there to Manilla and then onwards across the Pacific to Mexico (and possibly also Peru)! Interesting to hear about the pacific route to the Americas; one of my distant Latin matches (5.8cM) on DNA Ancestry appears to be of Guatemalan ancestry; this is the only country reported past 1st generation on her family tree -- I haven't been able to gather any more info since the user hasn't logged in since Sept. 2014 Same with most of these ADNA matches. Surprising and a bit eerie at the same time --I remember reading somewhere that slavers chose specific ethnic groups over others based on the kind of regional crops known to be harvested by a group -- these decisions of course would be based on what kind of plantation they'd work on in the Americas. I have actually seen similar data also for Panama and Cuba, again proving their presence but also their minimal numbers, and no specific or separate mentioning of either Northeastern Africans or Nilotics. I just want to point out most Nilo-Saharan speakers are heavily blended with bantu among other ancestral groups -- totally not implying you're unaware of this . From a glance at PuntDNAL's 47 subset of African populations, the only ethnic groups with over 50% NS ancestry are the South-Sudanese, Gumuz and Anuak. These populations would be a lot more easy to discern, not only to Europeans but other neighboring Africans groups as well -- most East-Africans could spot a group of Dinka (SSudanese) from a mile away; I think these are the more "pure" Nilotes that weren't noticed by Alonso de Sandoval and friends. So even though Kenyan Luos or the Songhai in Mali classify themselves as Nilotes, their phenotype can stray away from the stereotypical tall, dark, almond-eyed, dolichocephalic head shaped Nilo-Saharan -- naturally of course, given their NS ancestry can be well under 50%. I may have exaggerated the contrast a bit to make the point but I'd still say the above are typical of each group. Generally speaking, an NS speaking Ugandan could pass for either of the two Sudanese in regards to facial features -- a giveaway would be the tall height which isn't as consistent in the West-Nile region -- Ugandan Luos like the Acholi might be an exception. If you were to look at a family portrait of my siblings, you'd notice some have more pronounced stereotypical "NS features"; one sibling definitely looks a lot more "Bantu"than the rest. I think this range of phenotype within NS speakers in East-Africa and the Sudanic belt would make it harder for foreigners to ascertain a minority of NS speakers among the dominant group of enslaved Bantu. It came as a bit of a surprise to find out how little NS I had (46% PTDNAL K15) -- same goes with other NS speakers (Alur-Uganda 36%, Bulala-Chad 43%). I guess that partially explained why I lucked out on the height gene - I'm a mere 5'7, same with my dad -- I'm told both of our grand and great grandfathers were considerably tall; I didn't notice an overall drastic change in height when traveling the predominantly Bantu southern half of the country -- although facial features combined with complexion can be a dead give away. Amazing references by the way, these sources add a lot of substance to the thread. I'm sure you've quenched the curiosity of many and answered a lot of questions for the moment and for some time to come. Last edited by NiloSaharan; 03-15-2016 at 07:12 AM.